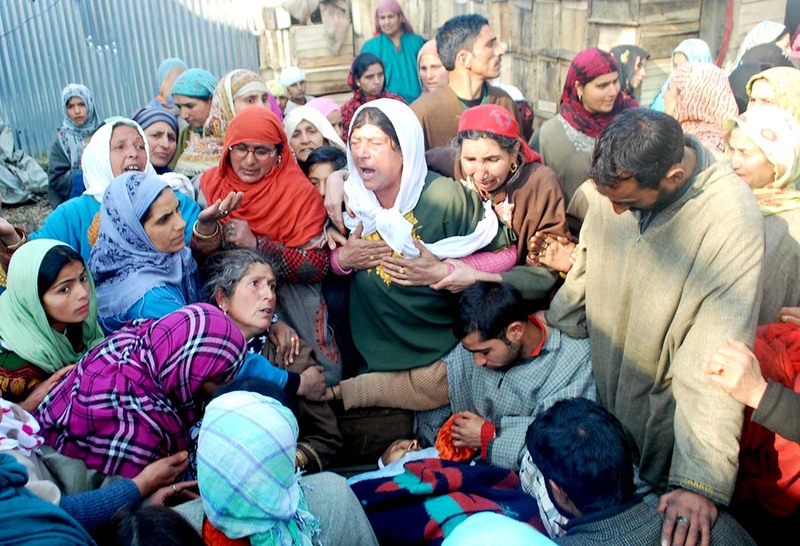 Wailing relatives of slain sarpanch in North Kashmir’s Baramulla district. Confined to the kitchen corner of her single storey house in Shopian, 72 year old Hajra Banoo looks around aimlessly. Hard of hearing, the ailing widow is hostile to talk. With blurred vision, wrinkled face and distorted denture, her eyes are moist and red. Her response mostly is a sigh and that too when she hears the name of her son, Ajaz Ahmad Bhat. Bhat, 40, lost his life to a volley of bullets in the courtyard of his house in 2014. His family watched the death while sobbing silently. In 2011, the family had festivities when Bhat was turbaned and taken in procession amid slogans. Then, he was elected as the Sarpanch after he defeated his rival. 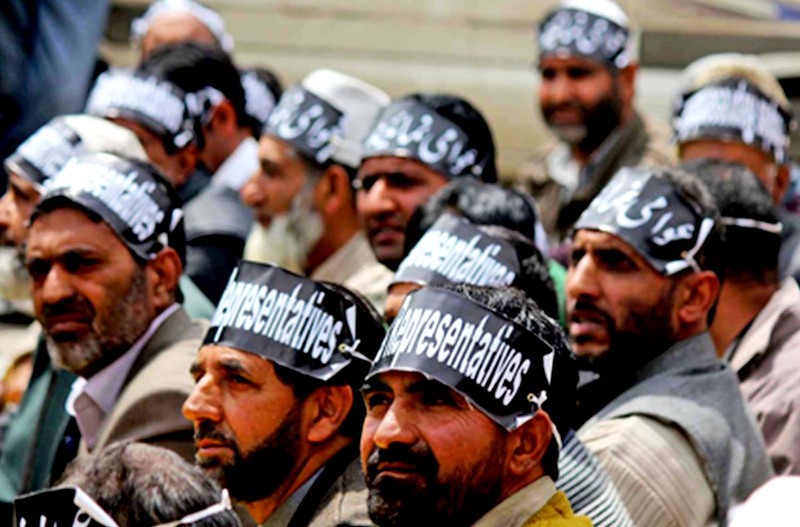 Watershed moment in the history of local elections in Jammu and Kashmir, 2011, witnessed the successful completion of the panchayat polls, nearly after four decades. Those were held in 16 rounds between April and June. With a state-level average voter turnout of about 77.71 percent, the elections were held for 4130 sarpanchs and 29,719 panchs, out of which 9424 were women. The overwhelming number despite 2010 unrest in which 120 youth were killed, emerged as the new narrative for the unionists. The local municipal polls, however, were held 13 years ago in 2005. Kashmir has 47 municipal bodies including the 73-ward Srinagar Municipal Corporation (SMC). Jammu has 37 bodies including the 71-ward Jammu Municipal Corporation (JMC). Down north, Gulzar Ahmad was jubilant to register a victory in his village in Baramulla. A primary school drop-out, he saw his victory as “vote for local development”. But the situation changed. Early 2012, he was heard on village Masjid loudspeaker, resigning from the post and seeking an apology. Reason? In the past week, two Sarpanchs had been killed in his district. “The fear of my life and no support from the government was the reason for my resignation,” Gulzar, now in mid-50s, said. He was one of more than 700 who resigned. “On one single day, there were 50 resignations published in our newspaper,” one manager in one major newspaper said. It was Prime Minister Narendra Modi announcing in his August 15, 2018 speech from the Red Fort, the panchayat elections, within “next few months”. N N Vohra, the then governor, though personally not supportive of the idea, gave the exercise a time frame: urban local body polls in September-October and phased panchayat polls between October and December. His successor Satya Pal Malik sees it his first assignment. Already over delayed, the panchayat polls were scheduled for 2016. Burhan Wani killing pushed it to 2017. Mehbooba government cancelled it though BJP was not on board. Finally, Malik led State announced the final schedule. Accompanying Malik, NC president Dr Farooq Abdullah in his own style denounced militants and separatist leadership for boycott calls. He urged people to participate instead. Few days later, Farooq led NC boycott the same polls. Reason? Centre failed to take effective steps for protection of Article 35-A of the Constitution in the Supreme Court. However, the state bureaucracy boss, the chief secretary BVR Subrahmanyam reiterated that the government will go ahead with the elections as per the schedule. The thought process is that elections on non-party basis will save the show. NC and PDP, two major regional parties have opted out of the contest. Separatists have reiterated the boycott. Militants have issued threats with acid. Will the grassroots exercise actually take place? The government has constituted two committees to ensure smooth inter-departmental coordination to facilitate the elections. Security situation, particularly in south Kashmir, is a major challenge. How to protect the contestants and then how to encourage voters to participate? But the administration is keen to hold polls. With Dilbagh Singh as the next police chief, officials say, Centre has already deployed around 237 companies of Central Armed Police Force (CAPF). The officer believes the situation on the ground has drastically changed from 2011 to 2018. “See we should accept 2018 is not 2008. We all know what happens in the valley and can anticipate the costs. Pertinently, in the by-elections for Srinagar in 2017, only seven percent voters cast their votes and seven killings took place. Ali Muhammad, 45, braved threats in 2011 and jumped the bandwagon. He won and wanted to work for the people. As 37 year old sarpanch, Mohammad Shafi Teli was killed at his doorstep in Nowpora, Ali was caught in the quagmire of life and death. As the figures suggest, 16 panchayat members have lost their lives since 2011 while over three dozen are reported to be injured. Next Article BJP’s Plan B?